Bunkersite is mainly about the German fixed defences built during World War 2. We cover them in a total concept of architecture, construction, tactics and weaponry. Occupying units are mentioned by name, but without any personal details or actions taken by them. Henk Adriaanse came back with these pictures of an impressive museum village in June 2011. Both authors of this website decided that there has to be place for the awful events that take place in every war. The tomb with the remains of the 642 fallen martyrs. 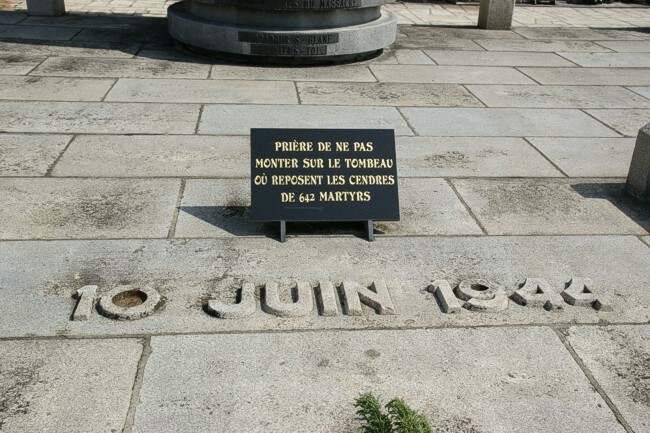 On the 10th of June 1944 the village was scene of a massacre inflicted by the 3th Company of the "Führer" Regiment. It was part of the SS-Division "Das Reich". Officers of this unit were looking for their fellow officer, who was missing. They believed that he was killed by the French resistance. This possible provocation has never been proven. However, the visiting officers started their action in pure revenge. The population was haunted together on the marked places. They were devided in two groups; the women & children and the men. The first group was taken to the church, they thought to be save in the house of God. The men were taken to sheds, garages and winecellars. SS-soldiers fired on the legs of the innocent men, they fell upon eachother and than the "job" was finished with more bullets. The men, mostly still alive, were covered with hay, straw and wood and set afire. Women and children in the church were surrounded by machineguns outside and the Germans brought in cases with explosives. The fuses were lit and any attempt to escape was prevented by Mg-fire. The balance: in total 642 inhabitants were massacred.